Let’s suppose that you were asked to deploy a Wi-Fi network in a restaurant and that your customer wants to collect their Wi-Fi clients’ data to promote their events and special evenings. In order to collect this type of data easily and quickly, we encourage network admins to enable an easy way for users to login to the Wi-Fi, avoiding complex and long forms to fulfill. This social login flow consists of asking Wi-Fi clients to “Log in with Facebook. UX: After connecting to the Wi-Fi, the Wi-Fi clients will see a splash page, that can be customized with the customer’s logo, their preferred background, and type of advertising. In order to log into the network, they must click the button “Log in with Facebook” on the splash page which will give Facebook permission to access their data. If they accept to provide their complete anagraphic information (or a part of them) to the app “Access Internet”, they will connect to the internet. PROS: No complex permission needed, no Facebook review needed. Super-easy login flow for the user. You can collect user data (name, surname, hometown location – country and city, birthday, e-mail, age, gender). CONS: Because not everyone has a Facebook account, you should enable an alternative way to log in (e.g. e-mail, Twitter, Google+). Why become Tanaza Wi-Fi Academy certified? What is the Tanaza Wi-Fi Academy? The Tanaza Wi-Fi Academy is a two-part certification program demonstrates your proficiency in the theory and practice of Wi-Fi and its applications. Currently, we offer two types of certifications: the Wi-Fi marketing certification and the Wi-Fi networking certification. The Tanaza Wi-Fi Academy is FREE and currently available in English, Spanish, French and Italian. The Tanaza Wi-Fi Academy certifications serve to test your Wi-Fi knowledge and certify you as a Tanaza Wi-Fi Academy professional, in either Marketing or Networking, or both. We want you to feel 100% confident in managing your networks and making the most out of your Wi-Fi connection and this brief program can help you strengthen your Wi-Fi knowledge and skill set. Most importantly, you can take the certifications as many times as you need to, in case you do not pass the first time around. Our blog for general news about wireless hardware, wi-fi industry, wi-fi management, public hotspots, wi-fi based marketing, and more. Consider that when dealing with networks and Wi-Fi the more you know, the better. Understanding your target users’ behaviors and setting up your splash page accordingly, are key to motivating Wi-Fi customers to access your hotspot. Let’s find out more about it. The first thing users see before accessing your Wi-Fi connection is your splash page. Accordingly, setting it up in a way that engages your users and motivates them to log in, is of paramount importance. But, How can I build a successful splash page? The answer is simple: by understanding your target audience’s behaviors. When customers authenticate to your Wi-Fi, you are able collect relevant data about them, such as age, gender, location, date of registration, etc. Once this data has been identified, you can leverage it by properly customizing your splash page with what Wi-Fi users want, so that they will be more inclined to share information to access your hotspot. Personalize your splash page in different ways. By opting for a very intuitive and quick authentication process, you can motivate your users to log onto your Wi-Fi network. Indeed, nobody wants to spend too much time when accessing a Wi-Fi network. Also, as a way to further involve and engage them when connecting to your hotspot, give your customers the possibility to authenticate using their favorite social network. Focus on incentives as much as you can. According to the incentive theory of motivation, external incentives make people more active and willing to take action. Therefore, you can reward your clients offering discounts or personalized deals when they sign in, as valuable triggers to motivate them using your Wi-Fi connection. Segment your audience so you can further customize the incentives you are going to offer. By distinguishing between new and returning users, or dividing them depending on their age range you can target specific users with tailored promotions. For instance, if you run a perfumery providing free Wi-Fi and realize users visit your shop only once, you could offer a discount for a second purchase during that same month, as a way to make them come back. Another example is to offer incentives on the basis of your customers’ gender: let’s suppose you have a clothing shop and you allow users access your Wi-Fi hotspot. Based on your Wi-Fi statistics, you detect that during the week the your users are mainly female, whereas in the weekends the average of female visitors is 60% to the remaining 40% is composed of male users. In this case, you could offer a discount on women’s clothing throughout the week, and opt for a discount on a male and female item of clothing during the weekend. By virtue of Tanaza, you can leverage social Wi-Fi to enhance your customer experience and better understand users’ behavior. In this way, you will set up the right splash page, which will motivate Wi-Fi users to authenticate to your Wi-Fi network. Tanaza allows you to easily build an engaging and responsive splash page for your customers: you can personalize the design of your login flows and choose your background and graphics. You can add multiple authentication buttons, to allow authentication via email, phone numbers, vouchers, and social login, allowing your customers to log in through Facebook, Instagram, Twitter, etc. Getting to know your Wi-Fi clients! Whether you are a new or an early stage company, which wants to operate in the wireless networking space offering Wi-Fi solutions, we hope you will find the following suggestions very useful. To begin with, start building client relationships based on your target. First, it is recommended to engage with small businesses at a local level, such as bars and restaurants nearby your place, as it is easier to directly interact with its owners. Furthermore, establishing a relationship with smaller clients can help you to reach bigger customers more easily. On the contrary, to start by targeting larger business, such as big hotels, would not give you the opportunity to enter in direct contact with business owners. Accordingly, focus on bigger clients once you have reached a good number of customers in the lower end of the market. Being at the entry-level of your business, it is advisable not to immediately rely on enterprise-class products, being that these are overpriced compared to what they offer. What is more, contracts related to these kinds of products do not allow you to change vendor, which also means that lock-in costs have to be incurred. Opt instead for affordable Wi-Fi products. Low-cost access points can help you minimizing hardware costs by still providing you with good performances. You can choose among many options in the low-cost Wi-Fi market: for instance, one of the main contenders supported by Tanaza is Tp-Link, a provider of SOHO & SMB networking products and WLAN products at global level. You could opt for TP-Link TL-WA901N/ND or TP-Link TL-WR941N/ND, two access points having basic performance suitable for SMB at an affordable price. Should the performances of these devices not be enough, you can rely on a more powerful class of devices belonging to Ubiquiti, a vendor providing various networking products and solutions for service providers and enterprises. For instance, the company’s UniFi UAP and UniFi UAP-LR devices are a valid option to consider. It is recommended to start targeting locations with 1 or max 2 access points, as the installation process becomes more difficult with the more devices you add. Typical examples of locations where only 1 or 2 devices are needed are small coffee shops, Airbnb apartments and small shops. Furthermore, when choosing the right location, remember to minimize wireless interference as much as possible. For instance, avoid installing your wireless network where physical obstacles can interfere with your wireless signals, such as trees, walls (concrete and steel in particular), water and reflective glass. 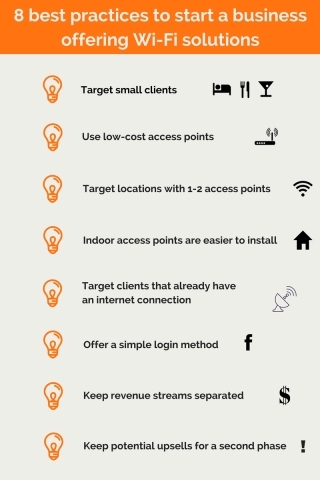 Considering that you target small clients, indoor devices are preferred to outdoor devices, at least at the beginning. This is because indoor access points are less expensive than their outdoor equivalent, as their installation process is easier. Indoor APs do not need have particular requirements to protect them from weather exposure (i.e. being waterproof), nor special installation skills, such as the need for antennas for wireless coverage and range. There are many indoor devices on the market: Tanaza can help you to choose among a wide range of indoor supported access points. Focusing on clients already offering a password-protected internet connection, and locations that already have connectivity i.e. through ADSL or fiber, enhances your chances to convince them to buy from you, as they do not consider broadband connectivity costs as a further expense to cover the add-on solution you are offering. Furthermore, you can improve your customers’ networks in different ways, for instance, if they are tired of giving their Wi-Fi password to each single customer you can offer your high-performance Wi-Fi captive portal. Furthermore, you can introduce innovative ways for data capture and user authentication based on social login, which enables users to log in with their favorite social network. In this respect, businesses providing Wi-Fi access using passwords, like bars, could benefit from such captive portal. The captive portal offered by Tanaza can be used as a marketing tool to collect user data with an easy-to-setup and easy-to-use Wi-Fi authentication splash page. Start by offering a simple login method for your clients i.e. Facebook login, as a way to boost your social visibility. Build an intuitive splash page with basic elements i.e. a background, a logo and a login button. Then, based on the amount of users connecting to the Wi-Fi and their feedback, the login process can be improved with further actions. For instance, the Tanaza’s Wi-Fi authentication splash page includes social login actions such as Facebook Like or/and Check-in. Support costs, which is recommendable to limit based on a determined number of hours or opened tickets, and preferably offered only remotely / through e-mail and not by phone 24/7/365. Installation and hardware costs, meaning adding a percentage related to your provided installation service to the incurred hardware costs. If you want to learn more about how to set prices for your Wi-Fi project, read this post about cost and competition-based methods and this article about value-based pricing and room-based pricing (for hotels and B&Bs). Last but not least, in order to make profitable margins by minimizing costs, it is better not to sell your services as an all-in-one solution, but rather keep potential up-sell features in a second step. For instance, start by configuring the device, the dashboard and the splash page on behalf of your clients and, should they need to view the users connecting to their network, add data capture and analytics tools to the services provided, to further increase your profits on those clients. Tanaza provides you with the right business model, helping you to create a profitable business in the social Wi-Fi space. Virgin Media is acquiring Arqiva Wifi to expand its wireless network reach and connectivity throughout the UK.